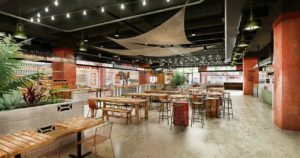 Eimer Design recently completed initial design for a planned 31.000 square foot food hall and marketplace in Carolina, Puerto Rico. The food hall is the anchor of a multi-million dollar redevelopment in the popular Carolina district of the island featuring over 40 vendors and market stalls. Project delivery is schedules for early 2020.